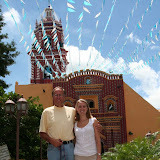 My parents came to visit us in Mexico in August – and we took a roadtrip to Puebla and Oaxaca. The beautiful colonial city of Puebla was the first stop on our trip, and we visited a number of the smaller towns in the area, including the giant pyramid of Cholula. We arrived in Puebla in time for lunch, and convinced the waiter at Fonda la Mexicana to allow us to bring Zookie into the restaurant, as long as we sat in the corner by the door. Sadly, we weren’t in Puebla long enough to sample all its famous cuisine – but we did try a few of the special regional dishes. Puebla is considered the cradle of Mexican Cuisine, having produced some of the countries classic dishes. Mole Poblano: a spicy sauce with more than 20 ingredients. Pipian: similar to a mole, but based on ground toasted squash seeds. Chiles en Nogada: a poblano chile stuffed with a spicy-sweet filling made of pork and chicken, and served with a walnut crème sauce and pomegranate seeds. After lunch, we checked out a few of the cities classic sites: the Museo Amparo, with its stunning collection of pre-Columbian pieces and colonial furniture; the Cathedral and Iglesia de Santo Domingo; and the Zocalo. We had to take turns visiting the museums and churches, as we had Zookie with us – and he wasn’t invited inside. Of course Zookie made friends, including another dog who wouldn’t leave him alone…my mom finally found refuge in a store of Talaverna pottery – where she ended up buying some beautiful pieces. We decided not to stay in Puebla, but rather in the nearby city of Cholula – famous for its pyramid. When Cortes arrived, the local Cholulans planned a secret revolt – but he was tipped off and managed to kill over 6000 Cholulans in just one day. Cortes then vowed to build a church for every day of the year or one on top of every pagan temple (sources vary). He didn’t get quite that far, but did manage to build at least 39…including the most famous one Santuario de Nuestra Senora de los Remedios, on top of the world’s largest pyramid. The Great Pyramid was built between 1-600 A.D., and was actually built over several times. As power changed hands, interest in the pyramid faded, and it eventually became completely overgrown and unrecognizable. It wasn’t until 1931, when Archaeologists dug tunnels, that it was proved that this was not just a giant hill, but rather a man-made pyramid. And yes, Cortes did build a church on top. In fact, we were lucky enough to happen to be visiting on a festival day, and were able to see the parade and festivities for the saint of the church! We also visited two beautiful and unique churches just outside of the town. The church of Tonantzintla is often referred to as Mexico’s most exuberant, with a brightly painted stucco interior in a style referred to as Indian Baroque. And San Francisco Acatepec is famed for its beautiful tiled exterior: decorated with blue, green, and yellow Talavera tiles set in red brick. -Small boutique hotel with six rooms off a large courtyard. The owners rescued this single-story colonial house from ruins and clearly have spent a fortune restoring it. We had a wonderful stay and especially enjoyed breakfast in the garden. Highly recommended.